It may be the first day of Spring today, but there is still snow on the ground outside. As much as I want to eat local asparagus and new potatoes, my farmer's market only have onions and pickles for sale. Instead of being sad about there being no spring produce, I have decided to embrace the end of winter. There may be no strawberries, but I still have a half bag of frozen cranberries in the freezer! You may think of cranberry and orange as more of a holiday flavor combination, but I really needed these last week when there was snow and hail piling up on my tulips. The snow is slowly melting and I'm crossing my fingers that my bulbs weathered the storm. Until the snow is all gone, I'm enjoying the last of my favorite winter treats - hearty soups, root vegetables and cranberries. If you are already enjoying jacket-free days, I'm really jealous of you. 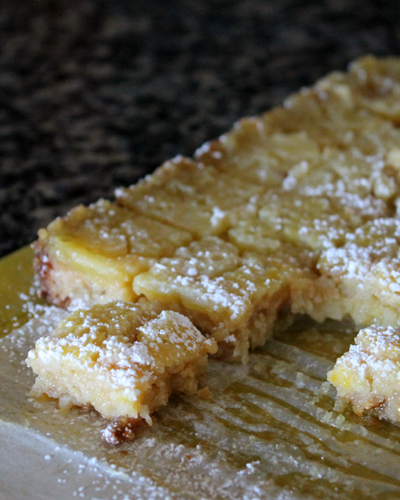 You can enjoy all of your fresh springtime produce and I'll finish eating this pan of bars. I'm sorry, I made you two desserts in a row! Last Thursday was a fruity and summery cobbler. 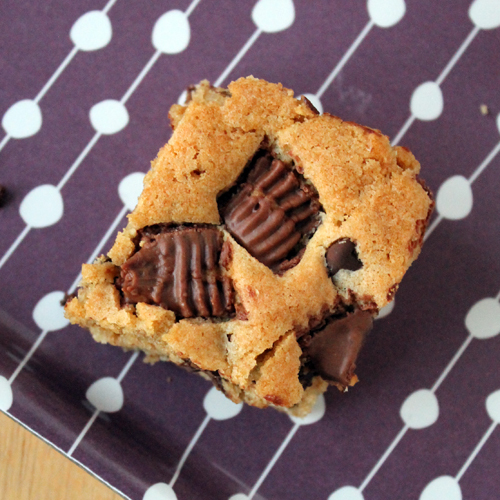 Today you get brownies. 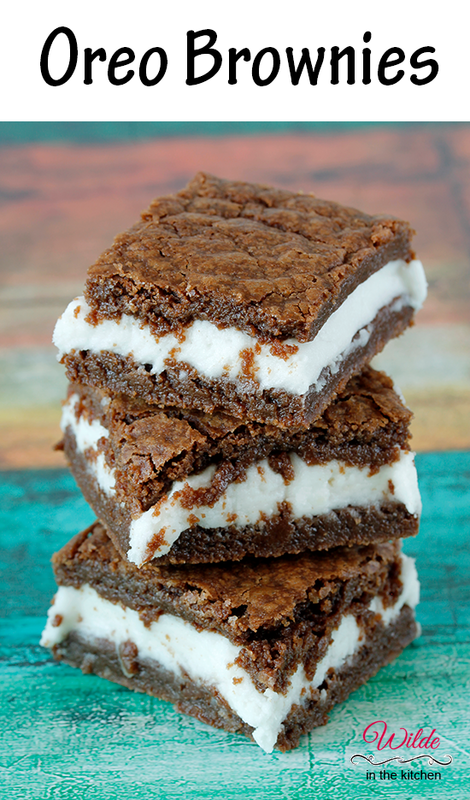 Brownies that are filled with cream cheese and hazelnuts. That's right. Cream cheese and hazelnuts. I'm absolutely terrible. So what if we are all still trying to maintain our cute bikini bodies? We all need a little bit of luxury every now and then. Besides, it's the middle of August. It's time to start getting ready for cooler temperatures. To be honest with you... 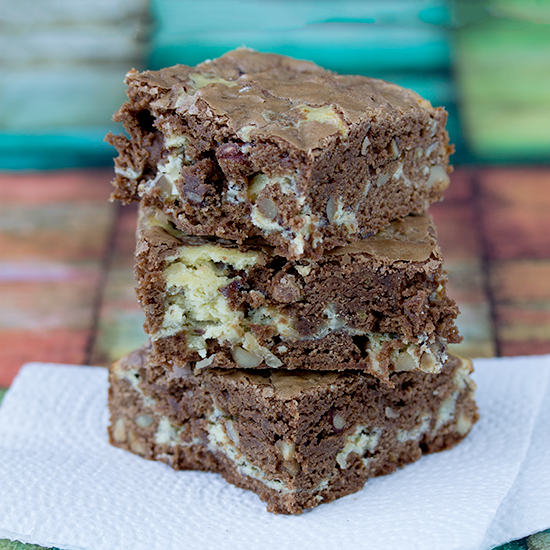 I baked this batch of brownies, photographed the 3x3-inch bars, and then cut the large bars into four smaller, bite-sized pieces. 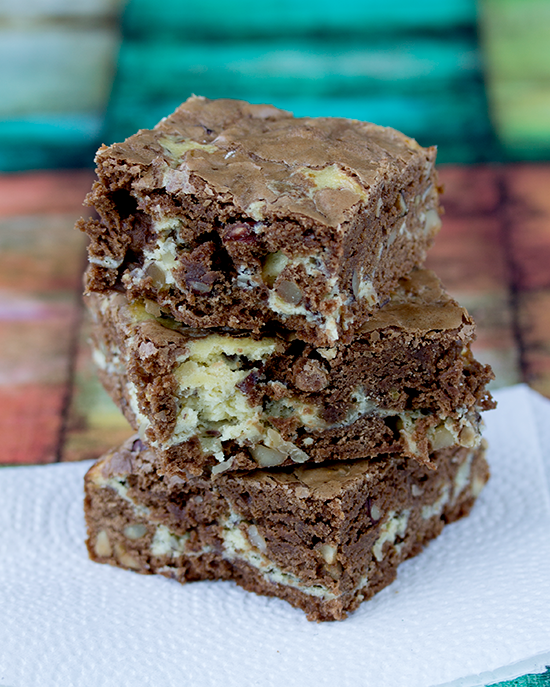 These brownies are so rich, there is no way you would even want to eat a big slab of brownie. Bite-sized is the way to go with these. Just be sure to toast the hazelnuts. I am totally in love with these bars. 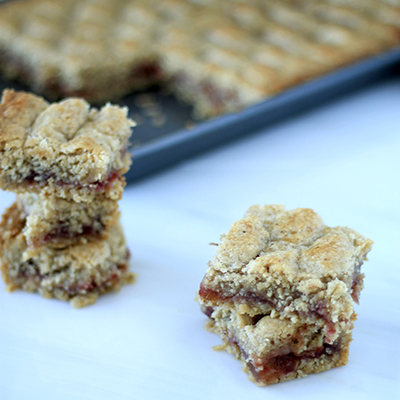 I've never made a Linzer bar before, but I will definitely be making them again. They are so stinkin' good! The reason why they are so delicious? Toasted hazelnuts. Amazing. These bars were a lot of work to make. Between roasting and skinning the hazelnuts, preparing the dough and rolling out and filling the pastry, it probably took half the day to complete this dessert. It was so worth it. I refused to share any of these bars with anyone else. So. Good. The major delicious part of this dessert is the hazelnut dough. 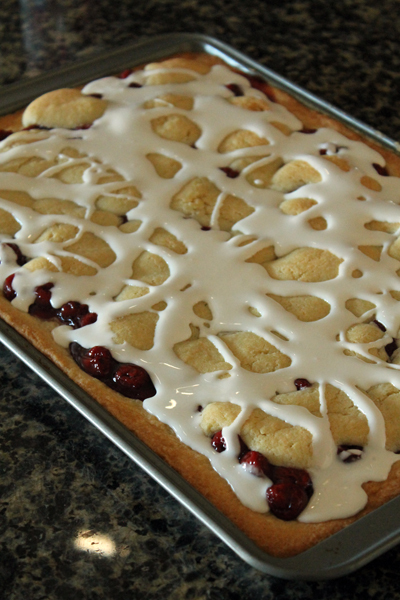 You can totally fill the pastry with your favorite jam. I went with a combination of raspberry and peach, a little take on the peach melba. 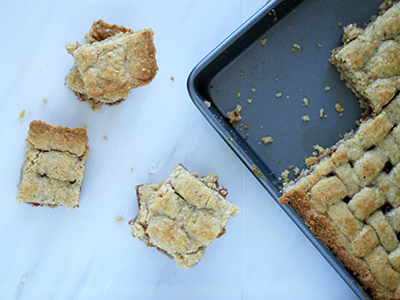 Since this treat is filled with jam, rather than fresh fruit, you can make it at any time of the year. I plan on making it again in the winter, with jam made from this summers farmers market fruits. 1. Did you stop by this week and have some cake? WITK celebrated it's third birthday this year and we feasted on Milky Way Cake! So good. 2. I finally made it to NY Cake & Bake this week and I was in sprinkle heaven! I had to hold myself back from buying the entire aisle. I want a rainbow of sanding sugars in my pantry and sprinkles for each holiday. 3. Did you know that J Crew only puts things on sale once they run out of my size? I desperately wanted these seahorse shorts, it just wasn't in the cards. 4. If you were wondering, I totally bought the flowered jeans from last week! I'm wearing them right now as I write this post. They make me very happy, especially since they were 50% off, plus another 50% off. 5. Heading to NYC? Want delicious brunch? Go to Tartine in the West Village. I went there with a friend this week and they make an amazing (and huge) apple pancake. 6. 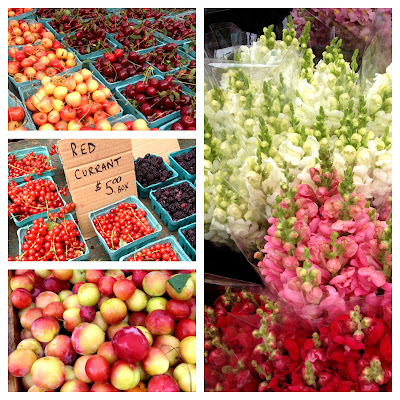 It's summertime in NYC and that means the Union Square Greenmarket is full of local eats. While I was tempted by the bright snapdragons and bunches of sweet pea blossoms, I went home with a basket full of Santa Rosa plums. I didn't bake them into anything, I just ate them. What can't you resist putting in your basket when you head to the farmers market? 7. Any other thirty somethings having a great summer watching Pretty Little Liars? Total guilty pleasure TV. 8. 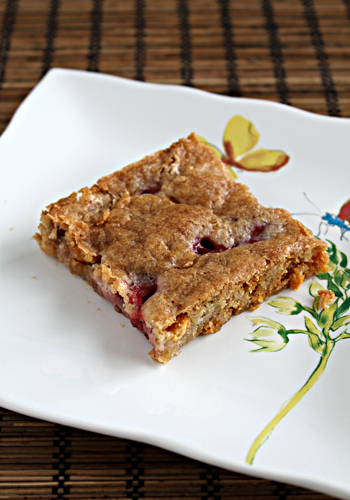 I posted these blackberry rice krispy treats on facebook yesterday and promised you a recipe. Guess what, it's so simple! Just use this... Blackberry Flavor Fountain (from LorAnn Oils!). They have a whole bunch of different flavors - bubble gum, cake batter, mango. 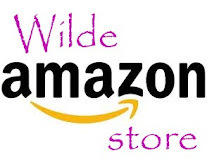 I got mine at a local specialty store, but you can totally order the syrup from their website or Amazon. Lightly coat a 9x13-inch pan in cooking spray. Wipe out the excess with a paper towel. In a large pot, melt butter over low heat. Add marshmallows and stir to coat in butter. Stirring occasionally, let marshmallows melt completely. Add black raspberry flavoring and stir until combined. Add cereal and stir to coat. Pour into the prepared pan and press into an even layer. Let sit for at least an hour before cutting into squares. What does someone do when they've been laid off? They go on vacation! No wait, that doesn't seem like the normal thing to do. Nonetheless, boyfriend and I are not in country right now, we are in Morocco! In a way it's a good time to go on vacation. It gets the mind off of the fact that I don't have anywhere to go in the morning. Boyfriend and I are currently in the Sahara desert, riding camels around. We got to spend the night in a Berber camp in the desert, where I saw the stars for the first time in a long time. We have spent the past few days in Marrakech and will be moving on to Agadir tomorrow morning, where we will learn how to surf! I'm very excited and totally frightened for my life. The ocean is scary and I'm hoping we're surfing little baby waves. On giant surf boards. While wearing floaties. 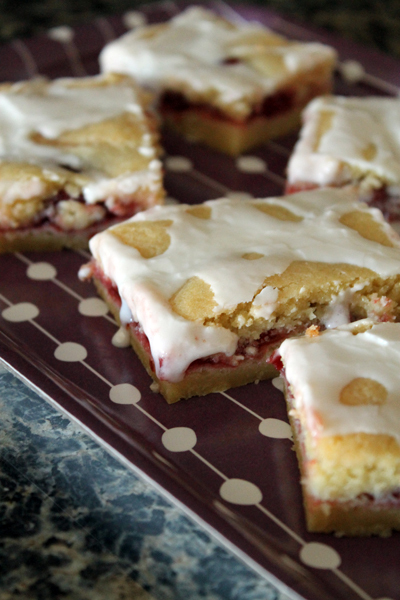 Until I come back, enjoy these uh-mazing strawberry bars. I made them just before we left, you know, in all my unemployed free time. I really enjoyed them hot with a big scoop of vanilla ice cream. For breakfast. Don't judge. 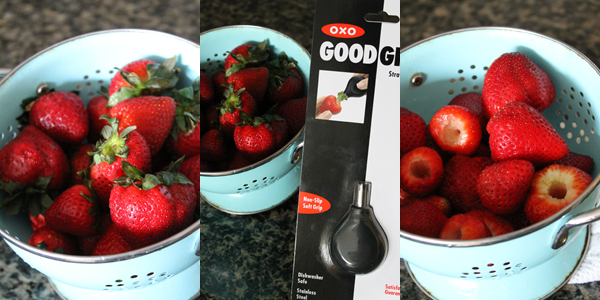 Disclaimer: OXO was nice enough to send me some fun fruit-related products as a part of their blogger outreach program, including the strawberry huller you see in the first image. I used the huller to remove the hulls of the strawberries. You can use a paring knife just as well, I like tools. I usually don't do holiday posts, but I had to make these. I don't really celebrate St. Patricks day in the traditional sense either. You know, the whole - wear green, drink a copious amount of green liquor and stumble home in the early hours of March 18th. It's not really my thing. What I do love to do is coat cereal in marshmallows. Then dunk the results in $10/pound Belgian white chocolate, you know, to class them up a bit. After I tinted the fancy, Belgian white chocolate green. They're super classy marshmallow treats. 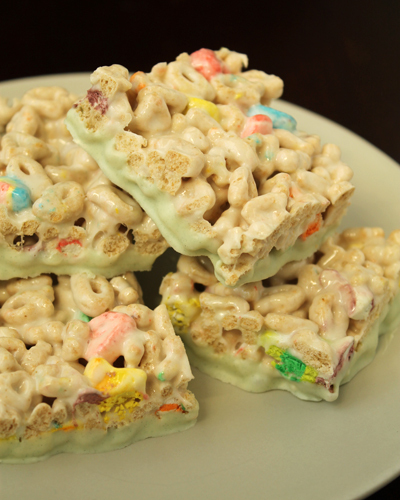 Go make them and celebrate like the Irish cereal-promoting leprechauns celebrate March 17th. Melt butter in a large pot. Add marshmallows and stir until melted. Add Lucky Charms and stir to coat. Coat a 9x13-inch pan with cooking spray. Pour marshmallowy cereal into the pan. Coat your hands with cooking spray and gently press marshmallowy cereal into the pan. Let set for at least 4 hours. Turn pan upsidedown to release marshmallow treats. 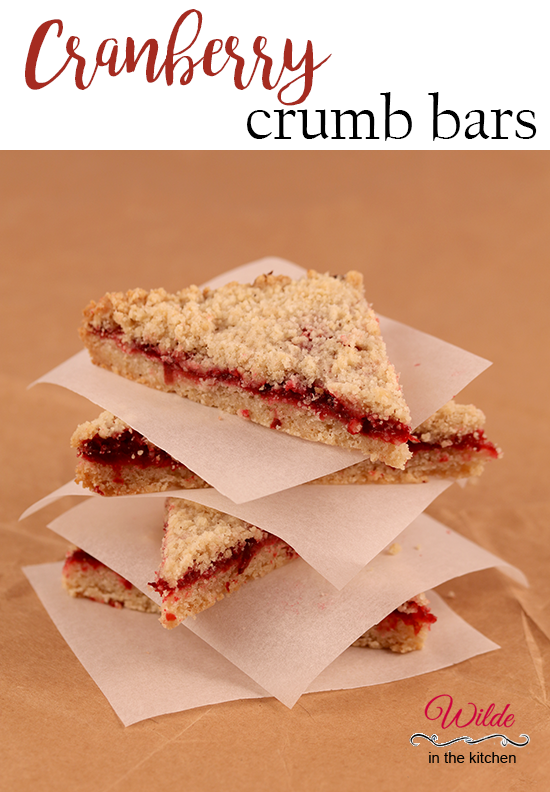 Cut into reasonable sized bars. Melt white chocolate in a bowl set over simmering water (or in the microwave). Add a few drops green food coloring and stir until evenly colored. 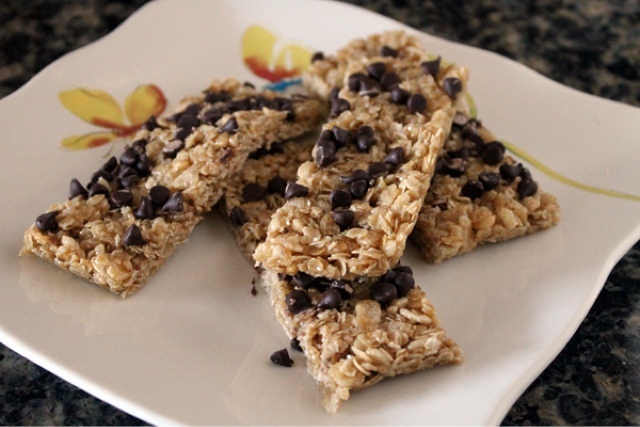 Dunk cereal treats in the chocolate and place on wax paper to set up and harden the chocolate. 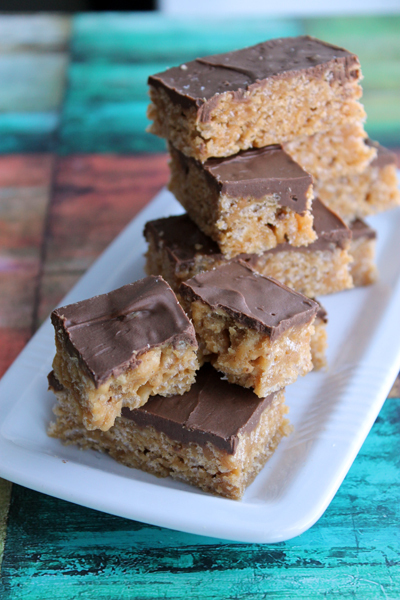 Several years ago, I ate almost an entire pan of scotcheroos at a Super Bowl party. And I didn't even feel guilty about it, because they were delicious. Luckily this was before the start of WITK. 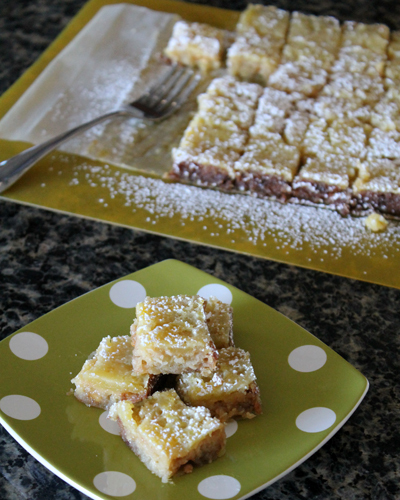 I wasn't obligated to recreate them in my kitchen and share them with you. 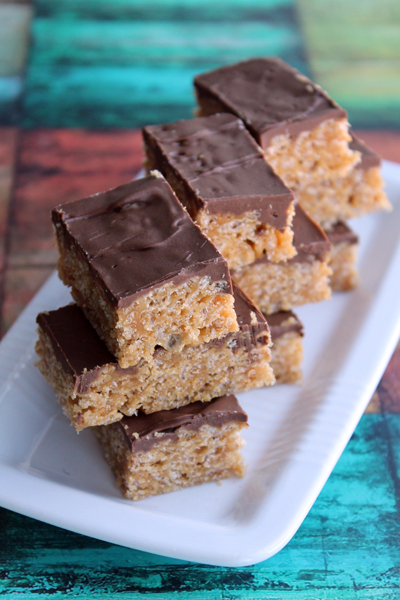 Little did I know that scotcheroos were a fairly common dessert treat and that you could find on the Rice Krispy website. It was only recently that I learned the name of the bars that I devoured in between watching SB commercials and gabbing with my girlfriends. It was at that same time that I picked up a jar of Biscoff spread from Fairway, fate seemed to have forced my hand to make these - Biscofferoos. I thought I was being all creative, as all we bloggers think we are, until I checked the internet. Apparently I was almost brilliant, except one person beat me to it! So close. 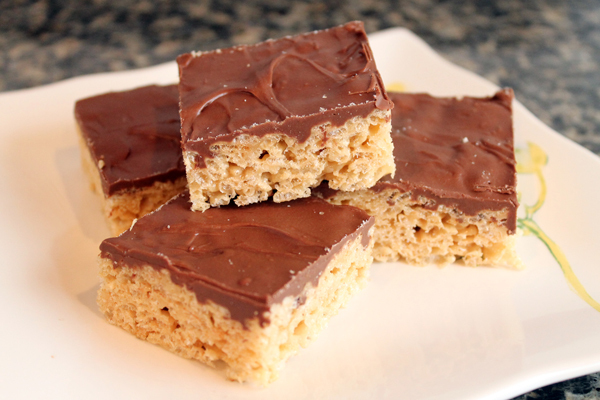 Were these just as addicting as the original scotcheroos? You bet your cutest pair of shoes they were! I ate so many of these. An unhealthy amount of them. Then I brought them to work and fed them to my unsuspecting coworkers. Mostly just one guy. He ate 90% of them. I ate the rest. 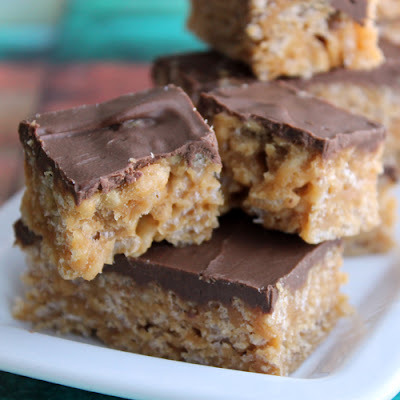 Side Note: Thankfully I made these before I began my marathon training, because I would have found myself sitting on the couch eating them and not lacing up my sneakers to hit the treadmill. I make a lot of desserts. I go through pounds of sugar every month. 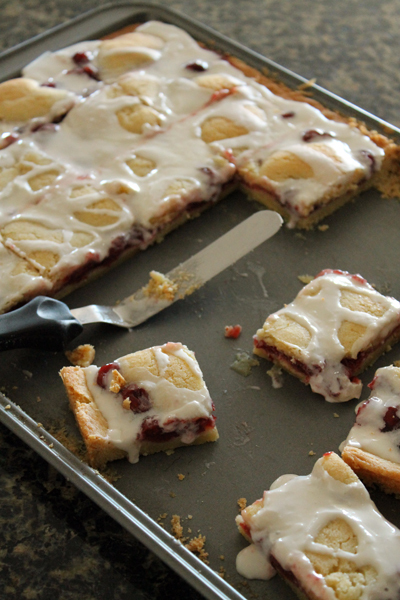 I love to bake, but I also love to fit into my jeans. 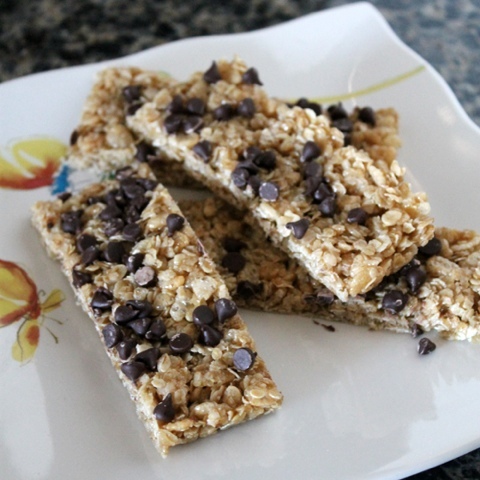 So here are the ways that I stay healthy and still make all these tasty treats. 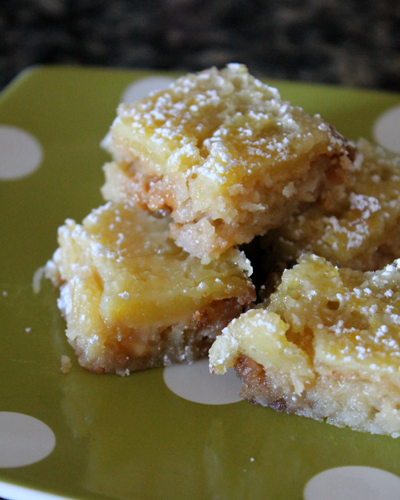 Maybe my tips will help you keep off the pounds but let you enjoy time in the kitchen! - For most of my recipes, I will make half batches. 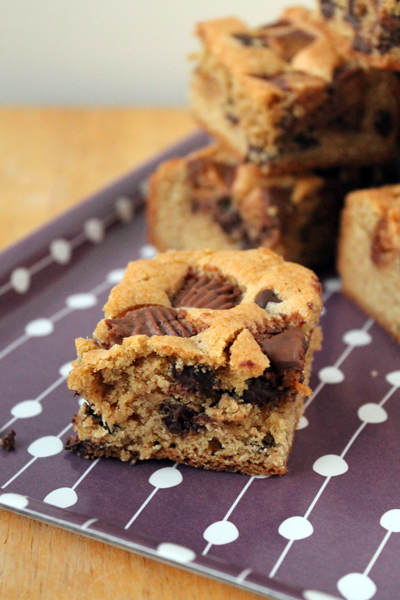 Having fewer cookies around means fewer to eat. - I make things that Boyfriend likes to eat. 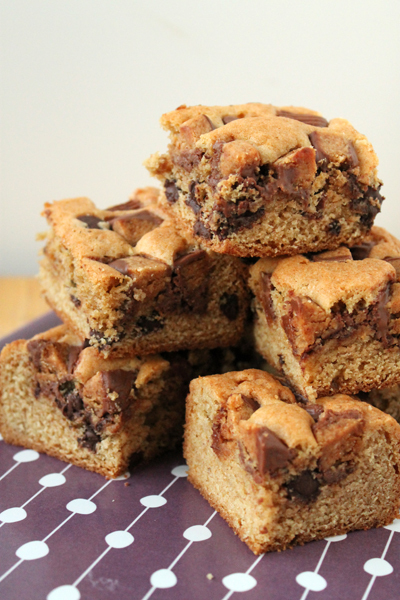 As long as I leave fruit out of my dessert recipes, he'll happily chow down cookies, brownies and blondies. He's six foot three inches and burns calories like a hummingbird. - My coworkers often enjoy treats on Monday morning. I once put an entire bundt cake in the lunchroom and left for an hour. When I returned, I found an empty cake plate. - Boyfriends coworkers also get to have sweets. Things like cakes, cupcakes and pies stay in New Jersey because they are awkward to carry on the commuter train. The most positive thing about sending them to work with BF is that I don't eat any extras. The downside? I've lost a few containers because someone forgets to bring them home. - The freezer is full of dessert. They are there if I really want something sweet. At the end of the month I go through the freezer and clean out all the excess food. Of course I also hit the gym several times a week and I'm on my feet a lot during the work day. I generally eat the same thing for breakfast and lunch during the week (oatmeal for breakfast & a salad for lunch) and I make lean protein and veggies for dinner. Repetition helps me maintain my healthy weight. Or you could think about it this way. The more cupcakes you feed your coworkers, the thinner you look in comparison! It's a win-win. We're really getting into the big eating season aren't we? It feels like it was Halloween just a few days ago and here we are, the day before Thanksgiving. The malls have already started decorating for Christmas and the Short Hills mall has set up a big Ice Age pavillion for photographs, it's a nice non-denominational set since we have such a diverse population here in Northern New Jersey. It might come as a surprise to you, but I won't be cooking Thanksgiving dinner this year. In fact, I won't even be eating a traditional Thanksgiving dinner. I'll be going out to a restaurant with Boyfriend and his parents (the in-laws!). Since I'm not cooking dinner, I took to the kitchen this weekend and made some treats for my coworkers. There were chocolate chip cookies, two French silk pies and these little pink beauties. 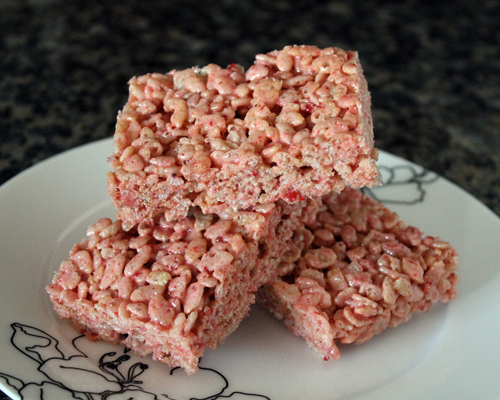 These are strawberry rice krispy treats. Made the simple way. 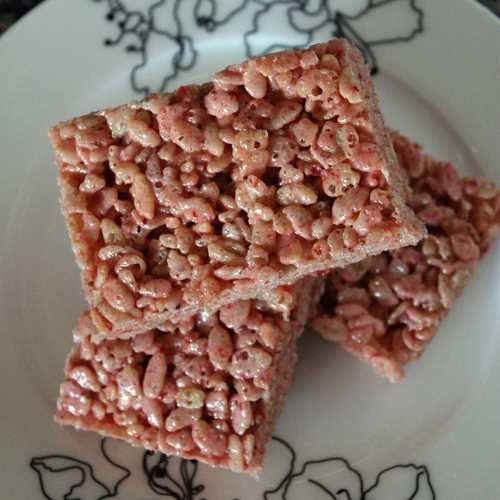 In the past, I have made flavored rice krispy treats using homemade marshmallows. 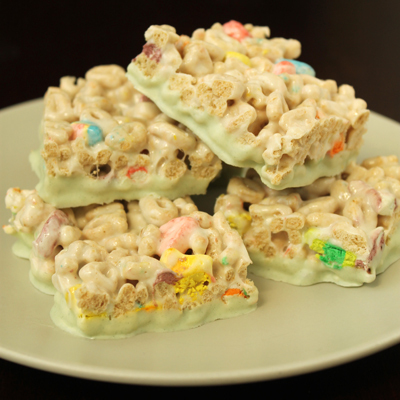 When I wanted to make flavored treats this weekend, I didn't have the energy to whip up a batch of marshmallows, let them cure and finally prepare the krispy treats. What I needed was a potent source of natural flavor. Dehydrated strawberries were the perfect solution. A little tricky to find (I got my dehydrated strawberries at Whole Foods), I sometimes find myself eating these little gems like potato chips. Luckily I had set aside a bag of berries for the purpose of making strawberry macarons. Instead, they made their way into these marshmallow treats and they packed a flavor punch. Seriously deep with strawberry flavor, the dehydrated berries were the perfect solution to making flavored rice krispy treats without all the fuss. I'm searching the health food stores for other dehydrated fruits that I can put into my next batch. I've already found freeze-dried pears and pineapples. What else is out there? dehydrated blueberries, apples, beef? 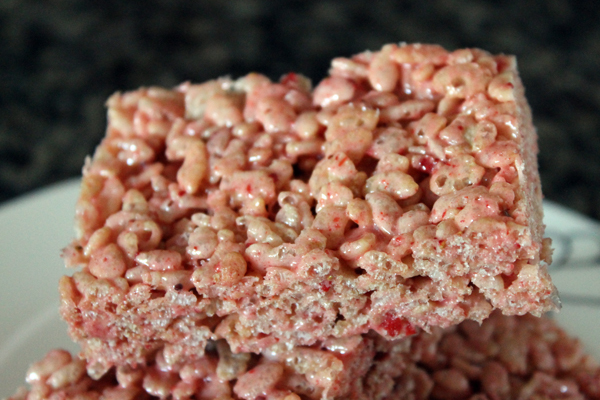 Okay, maybe no to beef-flavored rice krispy treats. I hope you enjoy your Thanksgiving, whether you are cooking, being cooked for or having pizza. I've had dessert already, so as long as I can score myself some turkey, it will be a good day! The thing that I love the most about warm weather vacations? Beach hair. There is no other time in your life that you can exert next to no effort on your own appearance and look absolutely amazing. The pink cheeks from a day spent exploring. The effortless clothes that say 'I have no where to be.' And the salt-infused hair that tumbles around in the wind. It all says vacation. Upon returning to the room after a day spent on the sand, I am loath to take a shower and ruin my beach-perfected look. As soon so I step foot into the fresh water my sun-kissed skin turns into a lobster red sunburn. My beachy waves lose all of their fun and I'm left looking like I spent too much time in the sun. But you can't go on without showering. Not only are you covered from head to toe in ocean salt, sunscreen and whatever beachside drink you inevitably spilled on yourself, but if you are like me you took half of the beach home with you. The post-beach shower is sadly necessary to remove all those rogue bits of sand that are trying to come home with you. Sure enough you'll be packing plenty of sand in your suitcase, there is no reason to let those tiny grains stowaway on your person. If I spend any time at all in the surf, I will have to spend an equal amount of time scouring myself with a loofah to wash away all the residual sand. Beachside showers and hoses are no match for the sand, it wants to come home with you. I'll be finding bits of sand all over the apartment and myself for at least the next two weeks. 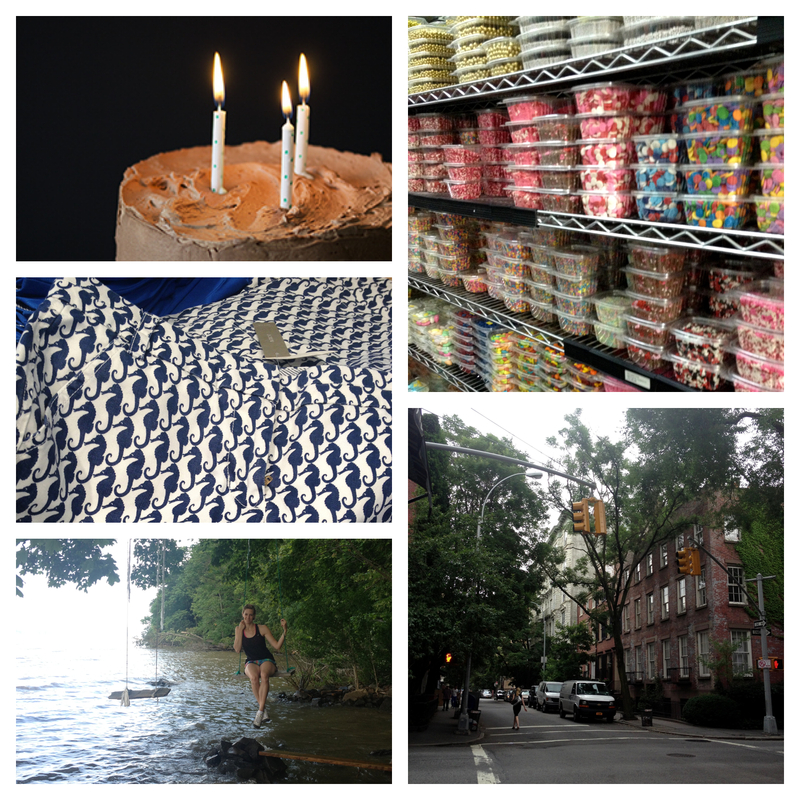 Small memories of vacation or tiny little nuisances? Only time will tell. Slowly, I'm coming back from the dead. The cold virus that knocked me down like a freight train has been galliantly fought off by my immune system and I'm on the mend. It has been rough, being sick at this time of the year, because this is the most fun time of year to cook! This is the time of year that you can make everything red, green and blue, cover everything in sprinkles and frosting and feed your coworkers endless supplies of sugar. They don't complain because it's festive. I had big plans to make you lots of cookies the week leading up to Christmas, these bars are as far as I got. While they were certainly delicious, I can't say that they are terribly festive. Now that we've made it past December 25th and the presents have been put away, I suppose that you need some treats to celebrate the New Year. Now that I'm living withing throwing distance to New York City, I've been getting lots of questions about what I'm doing for the big night. Sadly, since I've been sick, we haven't made any plans at all! A few years ago, before we were living here, boyfriend and I came to New York for the ball drop. We figured, "You have to do it once!" Unfortunately, that year it was freezing cold. I'm talking single digit temperatures as we approached midnight. We had layered pants upon pants and sweaters under our jackets, yet still, we were cold. There was no way we were going to sit still in Time's square for eight hours. We would have been peoplesicles. Instead we wandered the city from four in the afternoon until the ball finally came down to ring in the new year. We actually had a good view of the descending ball from our final position at the southeast corner of Bryant park. The winds were even blowing in our direction and we got a nice shower of confetti and balloons. However, moments after midnight, the crowds quickly dispersed and we hoofed it back to our hotel room as fast as our frozen bodies could take us. This year looks to be a lot warmer here in the Big apple. Does that mean that you'll see me in with the throngs of people in Time's Square? Not a chance! HAPPY NEW YEAR! I hope you spend it with people you love, whether you decide to ring in the new year at eight o'clock or midnight.